Today the delegates to the sixth Khoryug conference continued their discussions at Norbulingka Institute. Nestled back from the road between Dharamsala and Gyuto Monastery, the Institute offers an oasis of natural stone paths that wind over little streams and under leafy canopies of trees flush from monsoon rains. On the way to the radiant shrine hall where the Khoryug conference was held, participants pass a huge poinsettia tree cascading its starry red blossoms down to a pond while just beyond it, a mani wheel turns in the heart of a rivulet flowing down the hill. The site has provided a perfect setting for a conference on the environment. This morning, the Gyalwang Karmapa came to speak especially with the new participants and explain the purpose of Khoryug and what it supports. By way of introduction he gave two reasons why he started Khoryug in 2009. On a personal level, he was born in an area of Eastern Tibet known as Lhatok where he lived a simple nomadic life, passing his young years in such close contact with the natural world that it became a part of him. So when he speaks of the environment, it’s not just based on a sequence of logic or some understanding, but a very special, deep feeling. Showing this naturally, the Karmapa often touched the area of his heart as he spoke. These days, the environment has become an issue that interests everyone, he noted, and in particular, the ecosystems of Tibet and the Himalayan region have become critically important. One can approach the issue of Tibet from many different angles, he observed, culture, politics, or the environment, for example. And the question is not merely one of politics, he explained, but of the well-being and benefit for people within and beyond Tibet. While the issue of Tibet relates to a variety of situations, the environment is of particular importance, he remarked, because many of Asia’s great rivers find their source in the snow mountains and glaciers of Tibet. So Tibetan environmental issues relate directly to the numerous human beings and animals living in Asia since their lives depend upon the water flowing out from the country. 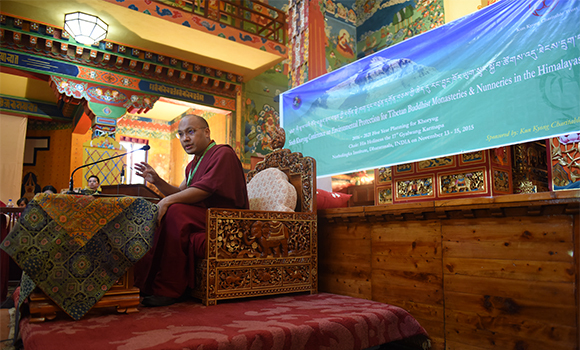 After discussing how the various groups could stay in touch with each other and share their experiences, the Karmapa turned to the topic of the earthquake in Nepal. He mentioned how well the monks from the Kagyu monasteries had responded to the needs of the Nepali people, enduring great difficulties to help. During this time, he was in America and gave considerable thought to disaster management. He concluded that it would be good to set up rescue teams of twelve people in each monastery. They would receive professional training and, if another calamity struck, they could help immediately both inside and outside the monastery. If we all do our part, he noted, we have tremendous power as people working together. 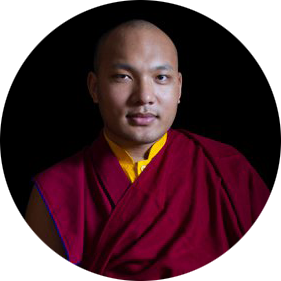 In closing, the Karmapa spoke of Buddhist principles that are especially useful today, and in particular, learning to reduce our myriad desires. The teachings say that the Sangha should “have few desires and be content.” Being content implies that we have the ability to distinguish between what we desire and what we need. Often we think we need what we really do not. If we cannot tell the difference between desire and need, what we desire becomes what we think we need, and we will have a hard time being content. In closing the Karmapa concluded that we should to work for the environment based on the Dharma and in harmony with the conduct of a bodhisattva, all the while paying attention to our motivation at the beginning of whatever we do.